The further digital imaging technology advances in resolution, fidelity and speed, the more photographers seem to miss the randomness, fragility and emotion of analog film. But the traditional analog workflow is difficult and unreliable, so most of us are happy to accept a compromise – a digital workflow that simulates the randomness of film. That’s where Alien Skin Exposure X comes in. Like Google’s Analog Efex Pro and DxO FilmPack, it takes regular digital images and adds grain, dust, scratches, lens flare, corner shading, vignetting, fading and practically every other film flaw you can think of to breath analog life into your images. Exposure is no newcomer to this market – it’s actually been around for ten years now. 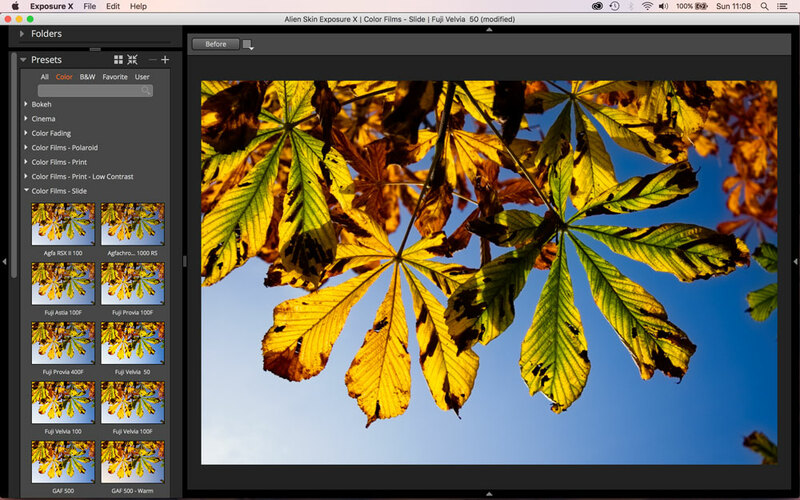 Parent company Alien Skin might not be one of the highest-profile names in the digital imaging industry today, but it goes back a long way – many designers will remember it for its famous Eye Candy plug-in, now up to version 7. Alien Skin makes other photography tools besides Exposure X, too, notably Snap Art (painterly effects for your photos) and Blow Up (enlargements without artefacts). Exposure has always offered subtle and carefully crafted simulations of classic films and processing techniques, but Exposure X takes a big step forward with new standalone and file browsing capabilities. You can still use Exposure X as a plug-in with Photoshop and Lightroom, but you can also launch it as a separate program independent of any host application. So let’s take a look at this first. 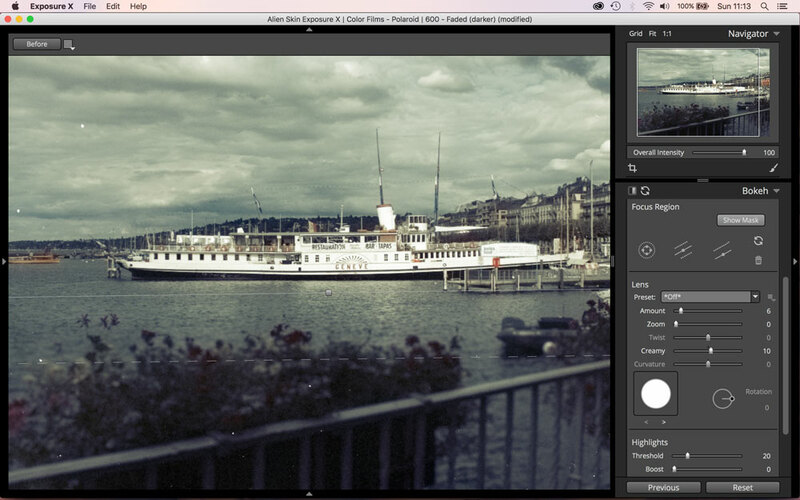 Alien Skin plays heavily on Exposure X’s simplicity, speed and effectiveness as an image browsing tool and especially the fact that there’s no time-consuming import process. That’s because it’s a folder browsing tool like Adobe Bridge rather than a database app like Lightroom. It is fast at showing, sorting and filtering the contents of folders, and if a simple folder-based filing system works for you, then this will tick all the boxes. Exposure does not support albums/collections, full metadata sets or whole-library searches in the way that Lightroom does, though, so it’s not really a direct competitor. But although Exposure X’s ambitions are simpler, it does work pretty well. You can flag photos, add ratings and colour labels, and then use a filter bar at the bottom of the screen to isolate specific images. You can’t create virtual copies in the way that you can in Lightroom, DxO Optics Pro or Capture One, but Exposure X’s adjustments are non-destructive. The original image is never altered and your changes are stored as sidecar metadata in the same folder as the photo. You can go back at any time and change your settings and, if you want a permanent version of the edited picture, you can export it to produce a new file alongside the original. This is how the standalone version works, at least. The plug-in works in the normal way, saving an edited TIFF or JPEG image back to the host application. In plug-in mode, Exposure X works in the same way as it does in standalone mode, except that there’s no Folders panel on the left. Usefully, you can open multiple images at a time and apply the same effects to all of them before saving them back to the host application. Exposure X follows a now familiar format for effects software, offering a wide selection of preset effects you can apply with a single click, but each of which is created using a stack of manual adjustment tools. You can start from a preset effect close to the ‘look’ you want, displayed in a panel on the left side of the screen, and then use the manual tools in the panel on the right to tweak it to your liking. Or you can start from scratch and use these manual tools to construct the analog effect you’re looking for – and save it as a preset of your own for re-use in the future. You do get a lot of presets to choose from, but they are broken down into Color or B&W effects and from there into different categories, such as ‘B&W Films’, ‘Bokeh’, ‘Cinema’ or ‘Lo-Fi’ effects. As you move the mouse pointer over an effect’s thumbnail, it’s previewed on the main image. This is really quick, though the effect thumbnails in the left pane can take a few moments to render as you scroll downwards. 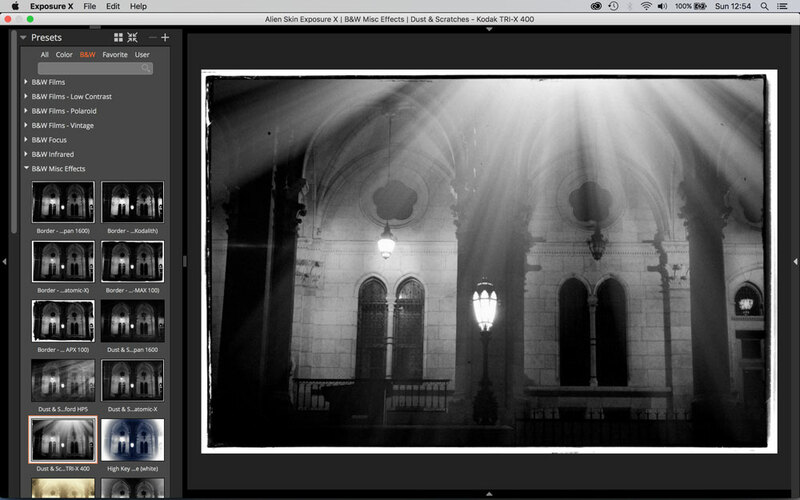 Over on the right hand side the tool panels are stacked vertically, Lightroom style. They include Basic adjustments (exposure, contrast, white balance and more), Detail (sharpening and noise reduction), Color, Tone Curve, Vignette, Overlays (frames, textures and light leaks), Focus (sharpening and blur), Grain, Infra-red, Bokeh and Metadata. The Metadata panel simply displays shooting and copyright information – it doesn’t support full metadata display and entry in the way that Lightroom or Adobe Bridge do. Alien Skin recommends starting with a preset effect and then using the Basic panel on the right to adjust exposure, white balance and colour settings. The half-planar Bokeh setting is particularly useful for blurring foregrounds or backgrounds only. 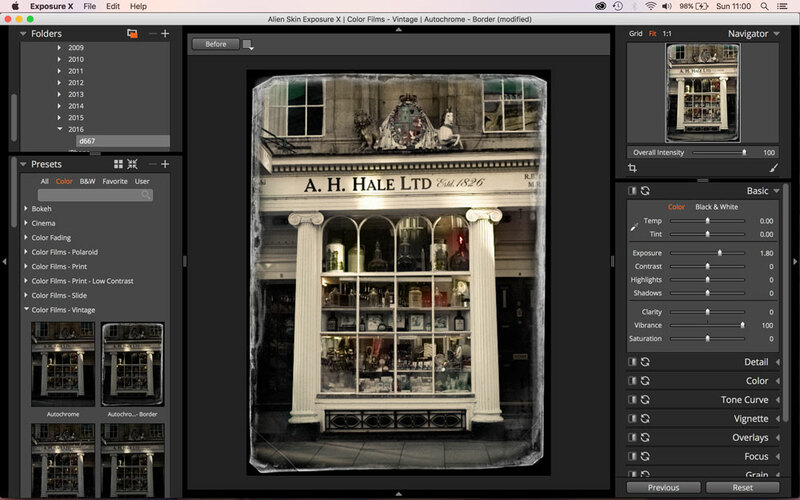 Exposure X is especially good at replicating antique wet plate effects, and you can mix and match frames, textures and toning effects manually. Exposure X can also simulate modern film emulsions like Fuji Velvia 50, though of course it can only overlay a ‘Velvia’ look on top of what the camera has already created. Film simulation may be made to sound like a science, but the camera’s own rendition is always going to skew the results. If you can imagine an analog effect, Exposure X can replicate it. 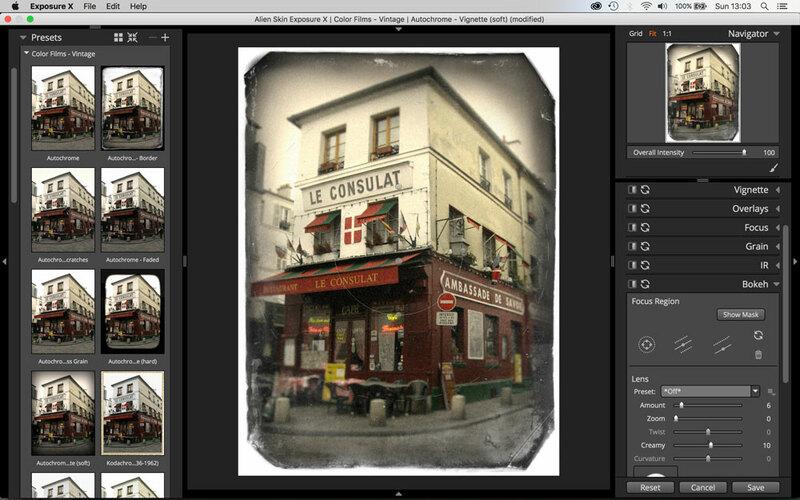 Its regular enhancement tools are modest but effective, and you can crop and rotate your images. What’s more, this version has brush and eraser tools for removing an effect from areas the picture or brushing one in. There’s also an Overall Intensity slider for winding back the strength of the effect if it’s too much. Exposure X offers a huge array of analog image effects, and there should be something here for every taste, from the wildly theatrical to the subtly atmospheric. Its wet plate, daguerreotype and autochrome effects are especially good, beautifully recreating the feel of antique photographs. The manual controls are effective too, especially the frames and textures in the Overlay panel – at last, a software publisher that knows how many sprocket holes 35mm film should have per frame! The Bokeh panel is especially interesting because it doesn’t just offer the usual planar and elliptical blur tools but a half-planar shape too for blurring just the foreground or just the distance, not both. 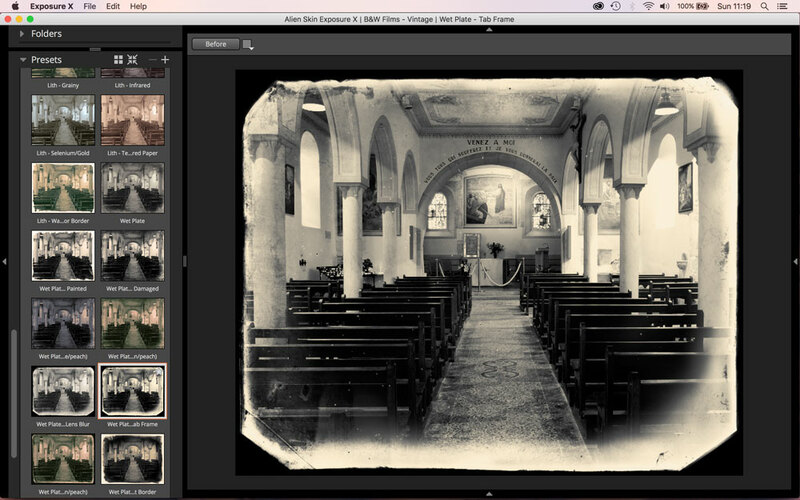 Light leak effects can add atmosphere to antique-look photos – its ironic that we now use software to replace the defects and artefacts that camera makers have been trying so hard and for so long to eradicate. Exposure X mixes its analog effects with more practical tools like this Tone Curve panel. This gives you more detailed control than the Basic panel at the top. So what about its rivals? Exposure X goes further than DxO FilmPack, both in its effects and editing capabilities, but at $149 (about £100) it costs more too – FilmPack 5 Elite is $100 (about £67). 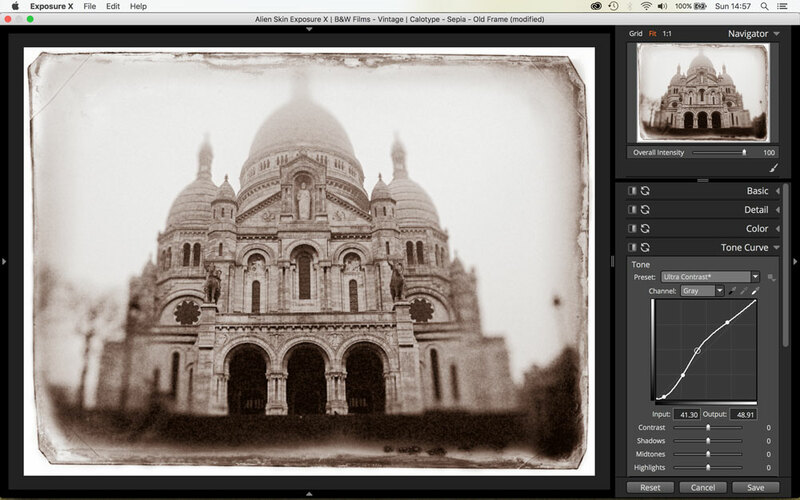 But then there’s Google’s Analog Efex Pro, as well. That’s a lot slower at applying and redrawing effects (on my MacBook Pro, at least), but has the most scope of all and does offer supreme editing precision with its control point adjustments (though not for all of the tools). You can only get Analog Efex Pro as part of the superb Google Nik Collection, though, which currently sells for £95 (about $145) and which you have to buy direct from Google by setting up a Google Payment Account. I still prefer Analog Efex Pro, even though it’s slower and only runs as a plug-in, but Exposure X runs it a close second, and its built-in browsing and filtering tools, non-destructive editing and simple TIFF or JPEG export make it an effective one-stop program for analog fans who use a simple folder-based filing system.